​Carlton Smith Pipe Organ Restorations is a company devoted solely to the restoration and preservation of the Theatre Pipe Organ, a uniquely American invention. These musical instruments are very different from their counter part, the classically designed church organ. 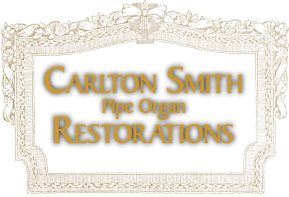 Founded in 1990 by Carlton Smith, Carlton Smith Pipe Organ Restorations performs the rebuilding and restoration of all manufacturers of theatre pipe organs to the highest quality of craftsmanship. Our restoration work scope includes console restoration and component restoration to the highest degree. We restore and maintain already existing historical installations in historic movie theatres as well as design and create new installations for theatres that have lost their original instruments. There are also individuals who desire these instruments in a private studio or home installation, Carlton Smith Pipe Organ Restorations provides these services as well. There is a very small group of qualified professional craftsman within the United States with accredited knowledge of the correct restoration of the theatre pipe organs. We perform full restorations and rebuilds of complete instruments. However, our specialty within this group of artisans is in the area of consoles and, specifically, historically accurate "art case" finishes and ornamentation restoration. Our company works hand in hand with assisting historic theatres, auditoriums, private studios and residences with the restoration of existing instruments and also to aid in acquiring or assembling new instruments. We place a high regard on our installations being carried out in the historically correct manner of the original manufacturer to the highest level.